SAN FRANCISCO - Dec. 6, 2018 - PRLog -- Lorraine Hansberry Theatre's (LHT) popular Soulful Christmas: A Gospel Holiday Concert returns for the fifth season from Thursday, December 13 to Sunday, December 23, 2018 presented in the Buriel Clay Theater at the African American Art & Culture Complex, 762 Fulton Street in San Francisco. San Francisco Bay Area gospel solo artist and Music Director, Yvonne Cobbs, conducts the legendary 16 member LHT Gospel Choir made up of both veteran and new choir members who sing inspirational holiday music -- both old and new, sacred and secular from Go Tell It On The Mountain to Boogie Woogie Santa Claus. The show is a roof-raising, hand-clapping, joyful good time for all ages, directed by Aldo Billingslea, LHT's Interim Artistic Director. Purchase Tickets online at www.LHTSF.org. Call (415) 474-8800 for more information (Tuedays–Fridays 1:00–5:00 pm.). The Box Office Will Call opens one (1) hour prior to curtain times.Tickets are available for purchase At-The-Door (pending availability). ABOUT YVONNE COBBS: Yvonne is a songwriter, director, recording artist, and actress who has graced the stage with some of the most influential artists in the world. She is a member of Harmony Missionary Baptist Church in Oakland, CA under the leadership of Pastor A. L. Perkins, and the Gospel Music Workshop of America, Northern California Chapter. In addition, Yvonne is a Nurse Practitioner and currently enrolled in the Doctorate of Nursing Practice program at Abilene Christian University. She has performed in many live stage plays including LHT's Black Nativity from 2001 to 2009, Mahalia: A Gospel Musical in 2010, and in a staged reading of The Amen Corner directed by Steven Anthony Jones at LHT In 2012. In March of 2019, Yvonne will have the honor of portraying Ms. Ella Fitzgerald in Ireland. ABOUT LORRAINE HANSBERRY THEATRE (LHT) Founded in 1981, Lorraine Hansberry Theatre, the West Coast's premiere African American theatre company, produced its first Gospel Music production -- James Baldwin's The Amen Corner -- 24 years ago. 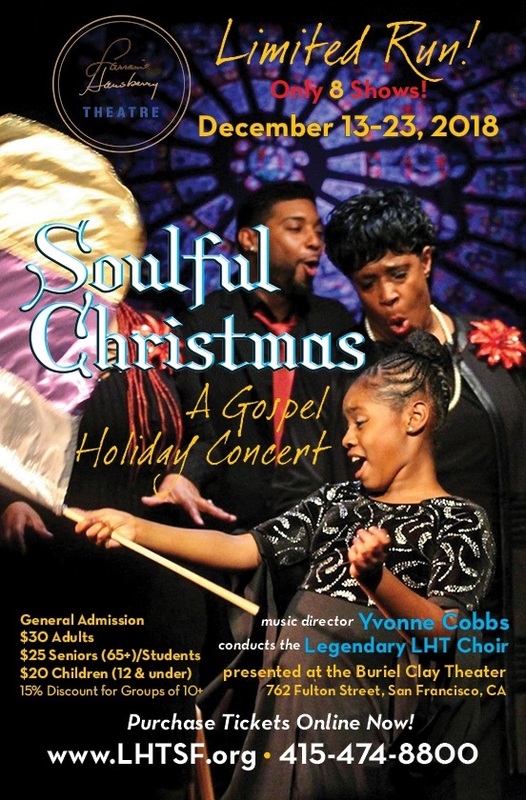 Since then, LHT has become especially renowned for its holiday gospel productions, including Tambourines to Glory and Black Nativity, both by Langston Hughes, the experimental Gethsemane Park by Ishmael Reed, and Vinnette Carol's classic Your Arm's Too Short to Box with God, among others. Interviews are available by arrangement.